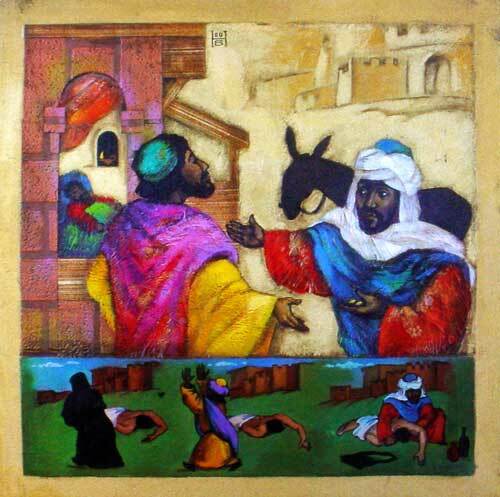 "The Good Samaritan" by Kazakhstan Artist Nelly Bube. AM I A MERCIFUL NEIGHBOR? The redaction critics think that this is merely a reworking of the same tradition found at Matthew 22:35-40 and Mark 12:28-31. No. The accounts in Matthew and Mark not only happened much later but are quite different. Ylvisaker: In Matthew and Mark it is a theological question. Luke's question is admittedly practical in character. Furthermore, did this passage in Luke take place immediately following the preceding" Some place it "in or near Jerusalem" That just can't be. The words clearly indicate a connection with a previous account. Most commentators are unanimous in considering verse 25-36 following immediately after verse 17-24 in which verses Jesus told the Seventy that God hid the Gospel from the wise and prudent but revealed it to babes and that the disciples had seen and heard the very things which many prophets and kings has desired to see and hear, namely, the fulfillment of the promises in Jesus Christ. Furthermore, this passage in no way contradicts Acts 16:30-32. In that passage the jailor is a fit subject for the Gospel. But the lawyer in our passage is plainly impenitent and self-righteous. He was one of the "wise and prudent", (verse 21) for whom the Gospel was still hidden. He was not yet a fit subject for the Gospel and that's why Jesus spoke as He did. Luke 10:25 On one occasion an expert in the law stood up to test Jesus. "Teacher," he asked, "what must I do to inherit eternal life?" The beginning word in Greek, not translated, calls our attention to something remarkable. It is similar to saying "Of all things!" An expert in the Law got up and came forward. He made himself prominent. He had a purpose, and his motives were not pure. Arndt: Not a simple seeker of the truth. Stoeckhardt: He was wishing to show the contradiction between His teaching and the Law of Moses. Ylvisaker: He may have considered the possibility that Jesus might give an answer contrary to the Law. Lenski: This man was disconcerted by what he had heard and offered his question to show that more was required for life eternal than just to see and hear what Jesus was showing the seventy. Fahling: His purpose was to involve Jesus in an unholy debate and to find reason for complaint. He is kind enough to call Jesus "teacher." But now he shows his colors. "By doing what will I obtain life eternal." It's a case of quid pro quo. "What for what?" The form of the question and the attitude differ quite some from Acts 16:30. Luke 10:26 "What is written in the Law?" he replied. "How do you read it?" Note the prominence of the Mosaic Law. Jesus also asks what, but the "what" is found in the recorded Word which this questioner knew well. "Which verse do you quote?" The man was evidently expecting an answer like that in verse 21-24, but is referred to the recorded Scriptures. Luke 10:27 He answered: "'Love the Lord your God with all your heart and with all your soul and with all your strength and with all your mind' ; and, 'Love your neighbor as yourself.'" He quotes Deuteronomy 6:5 (the Shema of the Jews, written above their doors, contained in their phylacteries, quoted each morning, in other words, well-known) and Leviticus 19:18. These two passages summarize the whole Old Testament, see Matthew 22 and Mark 12. He was not quoting Jesus. This is what Judaism said. For the term "the Covenant God" see Luke 1:68 where the same title is used by a believer. He, Zacharias, under the Holy Spirit, explains the meaning in verses 68-75, what this Covenant God has done for Israel. Note that in Luke 10:27 the world "whole," "entire," occurs four times. The terms denote the center of the personality, physical life as opposed to spiritual life, whatever strength of body, mind, and soul is available to a person, the intelligence or thinking power. No better description of the makeup of a human being has been offered than here. This entire personality should love, confidently trust in God. For "neighbor," the person near, only one requirement of selfless devotion is required: "as you already love yourself," doing everything necessary for his temporal and spiritual welfare, expecting nothing in return. This love is always an attitude, not just a feeling or emotion. Luke 10:28 "You have answered correctly," Jesus replied. "Do this and you will live." "That is the right answer." Jesus implies that the lawyer has not been doing this. Does the Scripture really say that a person would gain eternal life? Yes. Look at Leviticus 18:5; Romans 10:5; Galatians 3:12. But Scripture also says that a person can't do this. Look at Romans 3:20; 7:7-12 and 18; Galatians 3:10-11. Jesus had not fooled this man. Walther in Law and Gospel, page 10: The Lord, on this occasion, testified that, if salvation is to come by way of the Law, only he who fulfills the Law can obtain it. By the way, we are not to think that to those who do the will of God, salvation must come as a reward of their merit. By no means; their salvation, too, would be owing to the goodness of God. Why? Because to love the Lord with one's who heart, soul, strength, and mind means to believe in Him as a gracious, saving God in Christ Jesus. Luke 10:29 But he wanted to justify himself, so he asked Jesus, "And who is my neighbor?" "But" he was not expecting such a simple answer. He wanted to be his own judge and to absolve himself. Bengel: He invents for himself a righteousness easy of attainment. Lenski: He wanted to justify himself for asking his original question that he joins his new question to the other. His desire to justify himself betrays his ignorance about Leviticus 19:8 to say nothing about Deuteronomy 6:5. First he has asked: "By doing what?" That reveals his work-righteous attitude. Now he asks "Who?" which proves that he had an elastic, limited meaning for "neighbor," which betrays the fact that Judaism considered only Jews, and the well-to-do at that, as neighbors, certainly not Gentiles, and CERTAINLY not Samaritans. Sinful human nature picks and chooses its neighbors, those who agree with them and those whom they like. Others are often enemies. Look at Matthew 5:43-44. Luke 10:30 In reply Jesus said: "A man was going down from Jerusalem to Jericho, when he fell into the hands of robbers. They stripped him of his clothes, beat him and went away, leaving him half dead. Jesus picks up the discussion and relates a parable. Whether this account represents a true happening or is a parable made up for the occasion makes no difference. It is parabolic in nature. The road between the two cities is long and lonely to this day. First the thieves robbed him, then they stripped him, then they beat him up, then they left him. He was left for dead, in a desperate condition. They were without compassion. Luke 10:31 A priest happened to be going down the same road, and when he saw the man, he passed by on the other side. Marshall: The point is that the road was lonely, and a man might lie a long time before help arrived. Lenski: Otherwise the man might have lain there without anybody discovering him. This looks like "chance," but "by chance" God always provides us with opportunities to love our neighbor. That's the way it looks to us. All three of the men saw the situation, but the reaction of the first two was without compassion. Like the lawyer, they had a limited definition for "neighbor." In actuality they lacked compassion as did the robbers. They did by omission what the robbers did by commission. Luke 10:32 So too, a Levite, when he came to the place and saw him, passed by on the other side. Priests and Levites worked in the Temple. On this occasion both reacted in the same way. Perhaps they were afraid or in a hurry. By the way, neither is said to have been riding a beast. They were evidently traveling lightly, just to Jericho, it would seem. Note the frequency of "he," "him," etc. This shows the parabolic nature of this account. But the last person is different from all the rest. He was a Samaritan, a word hated by the Jews. They hurled the word at Jesus in John 8:48, an insult. Possibly the Samaritan was on a journey, likely more than to Jericho, he had provisions. He had a beast. He was likely on a business trip. He also was passing by, but the reaction is totally different. "Took pity" is used only in the Gospels, nine times of Jesus and three times in parables, Matthew 18:27; Luke 10:33; and Luke 15:20. No object is stated. Of course, the half-dead man is the object but the verse depicts him as a man of compassion. He "felt compassion," "was moved to pity." What a difference! "He went to him." Unlike the priest and Levite. Evidently the "pouring" preceded the "binding." Wine disinfects. Oil soothes. Bengel: These things are easily procured, which are more necessary for exercising love. True. In the large majority of cases we already have what is necessary to show love if only we'll use it. The words imply that the Samaritan walked. They went to a public inn. Most people would have stopped at that point, but he didn't. The text implies that the Samaritan took care of the man all night. The money represents two days' wages for the average man. Lenski states that it was enough to take care of him for two months. That may be a bit high, but it was quite an outlay. He gave like God Himself who expects nothing in return. The main clauses are: "Take care of him and I will repay you in full." If there is any lack, he will take care of it, and he will do that immediately upon his return. The Good Samaritan loves not only the wounded man but also the inn-keeper. He made sure he would not be a burden to the inn-keeper. He is an ideal example of compassion and love to those near him. Luke 10:36 "Which of these three do you think was a neighbor to the man who fell into the hands of robbers?" The lawyer had asked a question in verse 29 owing to his self-righteousness and limited view of Leviticus 19:18. Now Jesus asks a similar question, but turns it around. "Proved to be a neighbor" is a better translation that "was a neighbor." He proved it by attitude and action. It may be that the lawyer just couldn't say: "The Samaritan." But, in any case, his answer is correct. All his answers are correct. That's because Jesus was an excellent teacher. But, despite correct answers, he is still impenitent. Right here we must mention a passage from Luther, where he points out that it is a principle of Scripture that when God says "Do," faith is presupposed. The person of faith has a renewed will and responds when God says "Do." But the unbeliever, the person with an unregenerate will, cannot respond rightly. And, if he does, he does so in a work-righteous fashion. Therefore, the parable of the Good Samaritan is plainly an example of the second use of the Law, to bring this man to a knowledge of himself. Jesus was not angry with him but implies that the lawyer had not begun practicing mercy. He had not been doing it, and he is not doing it. How could he? He didn't even know the answer to his own question in verse 29, much less that neighborliness is always subjective not an objective picking and choosing. Do Christians need to hear this parable? Look at 1 John 4:20 and Luke 6:36. The unregenerate stand under the condemnation of the Law, are guilty of their sins and in the power thereof, are in the power of the devil, and are headed for eternal condemnation. In a word, they are blind, dead, and enemies of God. But they feel free to pick and choose what they want or don't want in the Law of God. Like the lawyer they pick and choose their neighbors, liking some and hating others, but in no case are they loving them as they love themselves. On the other hand, the regenerate are free from the condemnation of the Law, the guilt and power of sin, and the power of the devil and death. In a word, they have Christian Liberty. But, by faith they are immediately bound to the third use of the Law to love their neighbor as they love themselves. Like the Good Samaritan they show mercy to the needy and miserable, no matter who they be. Adapted from Exegetical Notes, Series C Gospel Texts, Sundays After Pentecost, by Harold H. Buls, Concordia Theological Seminary Press: Ft Wayne IN, 1979, pp. 23-26. Used with permission.